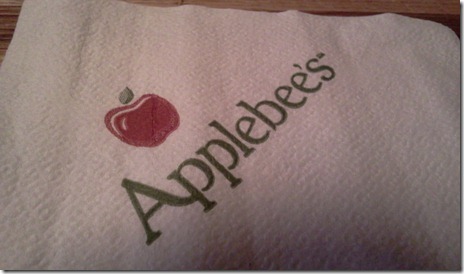 We recently visited Applebees located in Rimal Center in Exit 17. 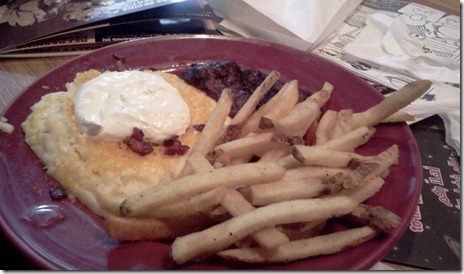 We are a regular customer here but it is only now that I will blog about the place. The staff is really great and they will make sure that you will get everything that you expect from the place. Staff are hospitable. The food is also great specially the salad and Beef steak. Here are some pictures taken using my Galaxy Tab. 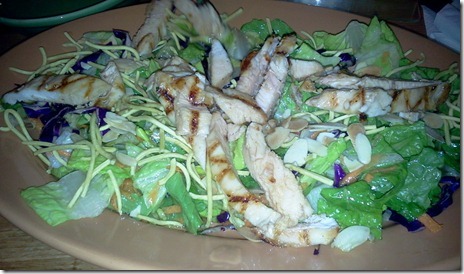 The Salad ( Green Salad + Chicken + Crispy Fried Noodles + Almond ) â€“ Try this salad and you will really love the taste. 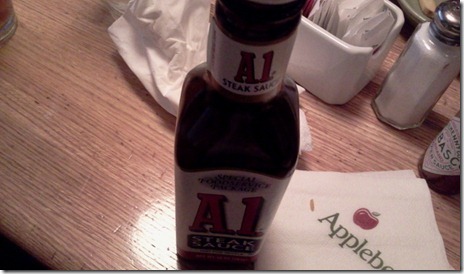 A1 Sauce â€“ I like eating steak with this A1 sauce. 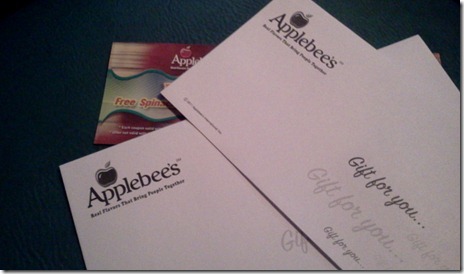 Gift Card from Applebeeâ€™s. Thanks for the Gift Card .. I forget the name of the salad. You may print it and show it to the waiter and they might tell you the name. Above mentioned salad is highly recommended. Lately I discovered that they also serve white rice. 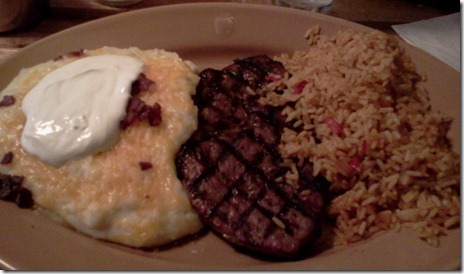 But of course you could order the steak as well done, if you don’t want to see a reddish color in your steak. As an additional information from Wikipedia, here is the information on how to order your steak. Seared, Blue rare or very rare ” Cooked very quickly; the outside is seared, but the inside is usually cool and barely cooked. The steak will be red on the inside and barely warmed. Sometimes asked for as “blood rare” or “bloody as hell”. In the United States, this is also sometimes referred to as ‘Black and Blue’ or ‘Pittsburgh Rare’. 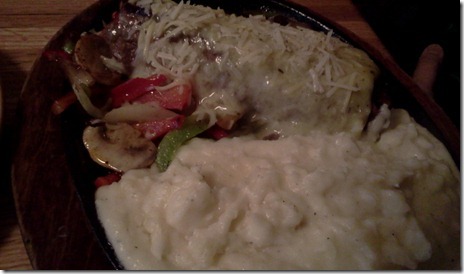 It is common for chefs to place the steak in an oven to warm the inside of the steak. This method generally means ‘blue’ steaks take longer to prepare than any other steak degree, as these require additional warming time prior to cooking. Rare (52 Â°C [125 Â°F] core temperature) The outside is grey-brown, and the middle of the steak is red and slightly warm. Medium rare (55 Â°C [130 Â°F] core temperature) The steak will have a fully red, warm center. This is the standard degree of cooking at most steakhouses, unless specified otherwise. Medium (60 Â°C [140 Â°F] core temperature) The middle of the steak is hot and red with pink surrounding the center. The outside is grey-brown. Medium well done (65 Â°C [150 Â°F] core temperature) The meat is light pink surrounding the center. Well done (71 Â°C [160 Â°F] and above core temperature) The meat is grey-brown throughout and slightly charred. Overcook (much more than 71 Â°C [160 Â°F] core temperature) The meat is dark throughout and slightly bitter. For me I prefer Medium Well. What about You ? Have you tried visiting Applebees in Exit 17 ?